Once just a typical Icelandic fishing village, Stykkisholmur is one of the most popular destinations to visit in Iceland and we're spending the fourth and final day of our road trip here. A ‘must-do’ here is the boat trip on the Breidafjordur fjord. We weave around many tiny islands (nearly 3,000 in total) which are a real hot-spot for nesting birds. Now, I had never thought of myself as a twitcher, but it’s really exciting, with over half of Iceland’s birds living in this region, the big favourite being the very cute (if somewhat ungainly in flight) puffin. Another highlight of the boat trip is a trawl from the sea-bed, this really is a unique experience, standing on deck eating fresh scallops, (I didn’t fancy the urchins), sushi style!. Back on dry land we are spoilt for choice with things to do: a volcano museum, library of glacial water, craft shops, pottery studios, golf range, city-hike along the harbour island above basalt cliffs, outdoor pool, church, lighthouse, Norweigan House cultural museum and great cafes and restaurants. But what really makes this town are the immaculately-maintained traditional buildings, each painted a different bright colour; it feels like a period set. As we wander around the quaint shops and houses, with the back-drop of snow-capped mountains, shimmering harbor and bay of many islands, it occurs to me this would make a great film location. It seems someone else had the same idea, with Stykkisholmur featuring heavily in The Secret Life of Walter Mitty. Homeward bound, only a couple of hours' drive and after four days I’m trusted to drive us back to the capital. Reykjavik is one of the world’s smallest capital cities with a population of around 120,000; it has a very ‘villagey’ feel. Drawing closer to the city (albeit a tiny, laid-back, easy, hip city which I love), I begin to get nostalgic for the great wild countryside, its dramatic panoramas and huge skies. I suppose its all relative! In town, there are lots of cousins to meet and catch up with and as it's the 17th June, it’s the great annual day of celebration throughout Iceland, Independence Day. It’s a very relaxed affair with street parades, family entertainment, balloons, candy-floss, free concerts and performances. Being this close to midsummer, the celebrations inevitably extend long into the small hours. What a great way to end our little 4-day excursion, seems like everyone else in Reykjavik is relaxing and celebrating with us. After a good night’s sleep (only possible in the constant daylight thanks to the hotel’s blackout curtains) we eat a hearty breakfast and head out again. Today, we’re going up onto the Snaefellsjokull glacier. Jules Verne set his novel ‘Journey to the Centre of the Earth’ at the volcano’s crater and we are going over the top of it. Mum enjoys the challenge of negotiating the narrow, un-tarmacked track that twists its way higher and higher. Luckily there is virtually no other traffic so her path is clear, with only the occasional skid caused by the loose lava stones! It’s an adventure exploring Iceland, with the potential for danger always around the corner. The Snaefellsjokull peak is a constant dominating feature of the whole region, but with the steep climb, the distinct three-pronged snow summit becomes elusive; it is closer than ever, but constantly disappearing from view. There are lots of stories connected to this glacier; a meeting place for extra-terrestrials, the home of a half-man half-troll creature, magnetic energies and one of the seven energy centres (chakras) of the world. Today, the views behind us out to the coast and of the snow peak are spectacular, but even when they’re covered in mist, there is something mystical about this place. Finally, we reach the summit and make our descent, I am not sure what is scarier, charging up or careering down this mountain, but better not upset the driver! The road down from the Snaefellsjokull glacier, you can see how high we climbed! We move on today, rounding the head of the peninsula and continuing our drive along the northern coastal road. There is a dramatic change from sun and clear blue skies to thick wet mists as we reach Djúpalónssandur beach, an awesome lava wonderland, which is said to be haunted. The iron remains of a British trawler, shipwrecked here in 1948, are still spread across the black lava beach. The weather brightens as we have our picnic lunch in Grundarfjörður in front of the breathtakingly beautiful Kikjufell mountain and we set off again for an amazing drive through the Berserkjahraun lava field, which of course has its own bloody Viking Saga attached to it. We turn off the main road and stop at Bjarnarhofn Shark Museum. Hildibrandur the elderly owner has been processing shark here for over 65 years. Mum and Hildibrandur are old friends; she has been bringing her groups to this remote spot for over 30 years now. The family business produces shark oil, which has healing properties for joints. It’s not for sale to the general public but, of course, Mum gets given a fresh supply to take with her. Finally, we arrive in the picturesque fishing town of Stykkisholmur where we’re spending the night and round off our day with dinner of locally-caught fish in hotel restaurant. Another glorious day, we set off heading west along the ring road of the 100 km long Snaefellsnes Peninsula. Our first stop is somewhere that so many people miss as it's off the main road, but seemingly from out of nowhere, there it stands. Gerðuberg, a beautiful wall of basalt columns and one of the longest examples in Iceland. The hexagonal columns are so regular in shape, with some towering 10-14 meters high. Despite the broken off chunks that lay scattered everywhere, like most things in Iceland, there is nothing to stop you getting right up close, which of course we do! A little further and we take another gravel track off the main highway. “You did bring your swimming things” Mum asks. Where is she taking me now, I wonder? Steam now appears to be rising straight out of a crack in the ground. This is the source of the geo-thermal mineral water pool Lýsuhólslaug, where luckily they also lend out swimming costumes! No chemicals are added to the water and the naturally warm water has healing properties. Iceland is dotted with geo-thermal pools, and unlike the crowds in the Blue Lagoon, Mum and I had the pool to ourselves and a hot tub each. All this floating around in soothing water is making us hungry, so with a picnic lunch, we make our next stop Buđir. Picnic on a beach in Iceland, who would have thought? Budir, one hotel, one church and then the sea. Buđir is a hotel, an old church and graveyard and a vast, beautiful protected lava field Búðahraun of pitch-black lava stretching down to the ocean. Most of the beaches in Iceland are black but this is one of the few places in Iceland with golden sandy beaches. We bask in the sun on the beach, ever hopeful of spotting an orca whale at sea, with the backdrop of mountains behind us. A guide’s work is never done, so onwards we go to Arnarstapi harbour. More amazing basalt rock formations off the coast here with plenty of nesting birds. There is a terrific coastal walk to Hellnar Hotel, our final stop for the day, which is right at the tip of the peninsula and at the very foot of the magical glacier Snaefellsjokull. Staying at Hellnar is always one of my favourite spots; so remote, peaceful and right on the coast. The hotel restaurant food is amazing, as are the views out to sea. At 10pm, Mum goes off to bed and I decide, with the sun still shining, it’s the perfect time to walk up the cliff path, sit back, take in the views and soak up the atmosphere. Ok, so a mother and daughter road trip is not quite ‘Thelma and Louise’ but it was an adventure nonetheless, exploring this very mystical and beautiful area of Iceland during the super-long days of midsummer. During mid-June there are almost 24 hours of daylight, which has an amazing effect on your body clock. You never seem to get tired which means that at 11pm and in full daylight, you can find yourself setting out on a walk to see another breath-taking view and watch the relentless activity of the hundreds of nesting birds! In Mum’s trusty jeep, we take the road out of Reykjavik towards the West with clear blue skies, which means there’s a very good chance of catching sight of the 1446 metre high snowcapped volcano of the Snaefellsnes glacier which dominates the whole area. Similar to yoga, in Iceland its not about the destination, its about the journey! In geological terms, Iceland is a young island, formed about 20 million years ago as a result of volcanic eruptions between the North American and Eurasian plates. Being sparsely populated means that the landscape is mostly untouched, raw, dramatic, vast and other-worldly. Some of the best photos I have taken are from the car window en-route - there is always something new and stunning to see along the way; waterfalls, mountains and valleys, rivers, lava fields or coastlines. Only an hour after leaving Reykjavik, we are crossing into the west on the second-largest bridge in Iceland, Borgarfjarðarbrú and head directly to Geiri’s Bakery which has great views over the water and serves fantastic fresh breads and pastries. It’s Friday and the roads are busy with people leaving the city for a weekend of camping. Many families have summerhouses out in the countryside or use one of the brilliantly-maintained campsites. It’s what Icelanders do, come rain or shine, they spend time enjoying and relaxing in nature. A short way up the road we make a stop in Borganes at the Settlement Centre. The interactive exhibits tells the story of Egill Skallagrimsson and recreate the most important of all the sagas, Egill’s saga, poet and Viking. This area is rich with stories of the first settlers and the second exhibit outlines the history of Iceland’s settlement. Good driving Mum! We reach our first stop, Hotel Hamar and after a three course dinner, we end our first day with the panoramic views of the mountains from the hotel's outdoor geothermal-heated hot tub! Iceland is packed with beautiful and memorable places to swim, but this has got to be one of the most unusual. The Askja volcanic crater is set in a lunar landscape where the American astronauts Neil Armstrong and Buzz Aldrin trained before their 1969 moon mission. Within than the Viti crater, a smaller explosion crater filled with milky-blue geothermally-heated water. Icelandic horses are directly descended from a controlled group brought over by Viking settlers; in AD982 the Althing (Parliament) passed a law forbidding the future import of any foreign horses so the breed has evolved exclusively in the conditions and climate of Iceland. Icelandic horses are famous for their strength, their small size, their intelligence and their unusual gaits. Most horses only have four gaits (walk, trot, canter and gallop) but Icelandic horses have a fifth ‘tölt' which occurs between trot and canter and makes for a smooth ride as the horse always has one foot on the ground and changes at an equal beat. Þingvellir in Iceland is one of only two places in the world where you can see two of the earth’s tectonic plates – in this case the North American and Eurasian plates - meet above the earth’s surface. These plates are moving apart by roughly 2 cm per year and you can dive between in the Silfra rift in Lake Þingvallavatn. Iceland has a number of unusual museums (Herring Era, Viking, the Glacier water library at Hofn and the least said about the Reyjavik Phallalogical Museum, the better) but one of our favourites is the House of Shark Jörundur museum, on the tiny island of Hrísey, which records the history of the island and shark fishing. The museum does not usually serve food, but if you know the right people, you might be able to swing a lunch of fresh fish and potatoes, apple pie and cream surrounded by the portraits, stuffed sea birds, fishermen’s clothing, harpoons and other artefacts of the museum! If you’re keen to have your own uniquely Icelandic experience, enter our Iceland with a Twist competition to win a discount on our 2016 Iceland Yoga Holiday. When contemplating a trip to Iceland, a swimming costume might not be a the top of your packing list, but make sure you bring one or you might miss out on a central part of Icelandic culture - a dip in the pool! Now, I'm sure you're thinking of the world famous Blue Lagoon, and yes, that's a lovely place to take a dip, but thanks to Iceland's geothermal energy, practically every city, town and village in Iceland has a large public swimming complex with the swimming facilities (pools, hot pots, water slides etc) outdoors. The country’s widespread geothermal vents and hot springs provide piping hot water which is siphoned off to public pools and minimally treated to keep it as pure as possible. 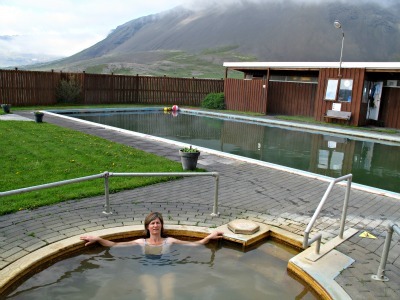 The Icelandic tradition of bathing outdoors in volcanically-heated pools dates right back to Viking times and, amazingly, a few of these old pools survive today – often in truly spectacular locations. Indeed it's so important to Icelanders that the Icelandic word for Saturday - Laugardagur - literally means "pool day" or “bathing day.” Many homes also have their own hot tubs outdoors too. Icelanders visit the pools year-round, no matter what the weather conditions and all pools will have at least one ‘hot pot’. Never mind the pub - these hot tubs are where the convivial Icelandic social scene really happens, where everyone exchanges gossip and news. It’s rumoured that going for a nice hot tub in the evening is a popular second date in Iceland and during work hours it's not uncommon to see business meetings conducted in the hot tubs too! As all Icelandic pools are far less chlorinated than pools in other countries, pool rules are strict, and no one is allowed to enter the pool without washing thoroughly. An outdoor soak is an essential part of the Icelandic experience but if you do forget your cossie, don't worry - you can usually rent one! The sun and spray guarantees a rainbow at Gulfoss waterfall. A must-do on every holiday to Iceland is the Golden Circle tour and there are three iconic stops, each of which unique and very popular. The first is Gullfoss waterfall or Golden Falls. The wide river Hvítá rushes southward, turning sharply to the right before plunging down a wide curved three-step 'staircase' and dramatically disappearing into a deep crevice. It’s hard to take in the volume of water that surges past; it’s simply breath-taking no matter how many times you see it. A bonus is always when the sun appears and a rainbow forms over the falls. Second stop is the equally spectacular Strokkur geyser in the geothermal area. It’s not hard to spot the main attraction with the huge circle of onlookers poised around a hole in the ground, cameras at the ready. This natural wonder is great because, dutifully, every 8-10 minutes a powerful jet of water suddenly shoots up vertically from literally nowhere. You wait, and you wait and you wait and then there is a churning from deep in the earth, water rolling and bubbling. It’s still impossible to predict and then whoosh in an instant the powerful burst some 20 metres high erupts, showering hot water. All that build up and anticipation and its all over in an instant. So exhilarating. Þingvellir is my favourite stop on the Golden Circle route. The place is so beautiful and peaceful, with a huge pristine lake at the centre of the vast national park. The geology is unique, with lots of evidence of the rifts that characterize the area, which sits along the Mid-Atlantic Ridge. The most impressive of these is the Almannagjá canyon formed by the constant drifting apart of the North American and European continental plates. Walking through Almannagjá gorge; one side is the European the other the North American continental plates which are continually pulling away from each other. Reykjavik may be the capital, but for Icelanders Þingvellir is the true heart of Iceland. The location has great historical significance, as it is where the oldest existing parliament in the world first assembled in 930AD. The early Viking settlers gathered here each year in June and debates took place, the law speaker who committed the laws to memory presided, and harsh punishments were meted out. From all corners of Iceland people made this annual pilgrimage to what must have resembled a mid-summer’s festival. Scanning the land, I always imagine crude camps, trading of horses and sheep, the bridal troths made, disputes settled, gossip exchanged, friendships and romance started and rekindled. I picture the campfires, music, livestock, rough shelters, fighting and flirting. I wonder how on earth they made these incredible journeys, how they survived - who were these distant ancestors of mine? A new competition in celebration of the 2016 Iceland Yoga Tour! To celebrate the New Year and the 2016 Iceland Yoga Tour, we ran a fantastic competition to win 25% off the 2016 Iceland Yoga tour and a complete yoga kit from Yogamatters (including a yoga mat & props). You can visit our Facebook page and our Pinterest page to keep up to date with the latest news on the competition. And the winner is Linda Robinson, who says, "Thankyou so much my prize has arrived and fantastic 😀can't wait till I use it". • Re-pin your choice of pins from our ‘Iceland with a Twist’ Pinterest board, with the hashtag #icelandwithatwist and a comment on why Iceland inspires you! Tour guide Svava and yoga teacher Fran waiting at the airport! Over 30 years ago, my Mum started to get a few friends together for sewing evenings. She was interested in traditional Icelandic embroidery, had learnt all the stitches and copied the ancient designs from museums in Iceland. This grew to holding small group classes in local libraries for students keen to learn the techniques and then to Mum travelling the country teaching workshops and giving lecture demonstrations. Whilst teaching these keen stitchers, Mum would tell them about Iceland and her energy and enthusiasm led the students to ask, “So when are you taking us, Jona?” And so Mum’s first tour came about, she made all the arrangements herself, hired the coach, guide and driver, and took her group to a country which was still very unknown at the time. These trips were a great success and quickly overtook the embroidery teaching! What characterises all of the trips is that they really are packed full of activities and visits and visitors get to see an authentic side of Iceland, Mum’s pride and passion for Iceland is so evident. On each year’s summer tour to Iceland, Mum would always take one of the children in the family. When my two daughters turned 10 years old it was their turn too and so every year one or the other of them would go with Grandma on a great adventure to Iceland. Looking at their photos I suddenly realised that they had spent more time in Iceland than I had recently and so I began to visit Iceland again every summer and my love for all things Icelandic grew stronger than ever. The 2013 Tour Group, just before doing the beautiful coastal walk from Arnastapi to Hellnar. After teaching yoga for several years, I began to consider organising a yoga holiday myself, as I knew from personal experience the enjoyment and benefits that a dedicated week of regular yoga practice can bring. So I suppose it was inevitable that the choice of destination would be Iceland. With over 30 years of arranging tours and taking groups to Iceland Mum already had all the knowledge of the best hotels, most reliable coach companies, loyal drivers, special places to visit and great places to eat. I knew that anyone interested in yoga would also instantly appreciate the peace and unspoilt beauty of Iceland. It was too good an opportunity to miss and I would get the chance to share Iceland with lots of new people! Of course unlike sun and beach yoga holidays, there is just too much not to be missed on any visit to Iceland. For this reason, I organise the holidays with a full itinerary; geo-thermal pools, lava fields, coastal walks, museums, glaciers etc. The bonus is a daily morning yoga class with like-minded people – you could say it’s Iceland with a twist! Driving out of Reykjavik along the southern coastal road, we travel east. There is a pretty sprinkling of snow, like the dusting of icing sugar on cakes. The big skies and landscape have a soft tone in this mid winter half-light. Tiny farmsteads nestle at the foot of looming mountains with ominous boulders the size of a house scattered around. In the otherwise barren fields, we pass groups of stoic Icelandic horses, fast flowing rivers, snow ploughs and hot steam rising from underground. The hardy horses, pure descendants from the Viking times, remain outdoors year round. High winds and a storm are predicted but we are in safe hands with Óli our driver who checks the weather reports constantly. We stop along the way to see the 200 feet drop of Seljalandsfoss waterfall, where today a ‘just married’ couple are braving the cold and winds for a breathtaking photo opportunity. Seljalandsfoss waterfall, a great backdrop for a newly-wed photoshoot! We pass Skógafoss waterfall and the Skógar Museum where all around are the traces of black ash. Lurking is the infamous Eyjafjallajökull volcano (which I can pronounce!). It is a sobering thought that it is only a matter of time before a larger devastating eruption will cause the destruction of the whole area as a massive glacial melt washes everything out to sea. Our destination is a country hotel, perched on the hillside, with sweeping views across the flat plains and out to sea. We are the only guests today as many places close for the holidays, so the children immediately run wild, playing chase or hide and seek along the many corridors, watching films in empty rooms. A spooky atmosphere descends in the empty hotel as the storm builds, doors and the roof shake, windows fly open in the night, and the road below empties of traffic. Luckily the kitchen supplies us with home-made soups and bread, the children are happy, teenagers catch up with Uni. essays, holiday photos are posted and a few brave souls battle the winds for a walk. What’s left? Yoga of course! Yoga in a deserted hotel! No mats, but a huge hotel lobby, with a class made up of my brothers, sister, sister-in-law, daughters and nieces. Perhaps one of the more unusual classes I have ever taught but everyone very happy to get a great stretch after the recent plane and coach journeys and lifting of cases, toddlers and babies. Luckily, the hotel owners wander past completely unphased, as if this was just an everyday occurrence. People here are used to adapting and surviving, making the best of unpredictable weather and adversity. Seems that in Iceland pretty much anything goes! It’s dark - I mean pitch black - outside and we are all emerging one by one from our rooms for breakfast. It really does feel like we are eating our toast and cereal at 3am. It's 28th December 2015 and I’m in Iceland with 17 of my family for a New Year’s adventure organised by my amazing Mum. We have already taken a domestic flight to Akureyri in the north - a scary tossed-about-in-the-air-hang-on-to-your-seats experience. Today we head to the other side of the huge fjord to Kaldbukur Mountain just over 1,000 m high, next to the small town of Grenivik. Here we meet amiable Bjossi and his caterpillar snow tractor: we are climbing this mountain!! How high we climbed in the snow caterpillar! Sitting on benches we take an open-air ride up, up, endlessly up to the summit. Spectacular views, the sweep of the fjord, mysterious half light blue and black contrasting blinding whiteness, clouds, huge skies, mountain ranges, snow, biting winds, power and throb of the tractors engine, squealing kids, happy amazed faces, a treat for all the senses. And then a dozen bright orange sledges are revealed and we take the longest most exhilarating descent down, bumping, spinning, gliding and laughing all the way. Yes, this is how we came down! Negotiating the solid icy quay, we climb aboard the ferryboat to be whisked across the fjord to the tiny island of Hrísey. 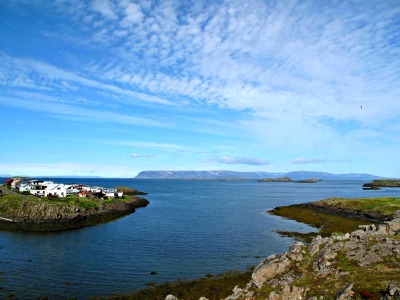 At 2.30pm the light is already fading, the sky is deep inky blue-black as we head to the oldest house on the island, the House of Shark Jörundur museum, which tells the history of the island and shark fishing. Recently renovated, the museum is a welcome refuge after all the outdoor activities. Down the centre of the main room runs a long series of tables and chairs, the tables set. The haunted museum does not usually serve food, but as Mum knows the owners she has arranged a special favour; lunch of fresh fish and potatoes, apple pie and cream surrounded by the portraits, stuffed sea birds, fishermen’s clothing, harpoons and other artefacts of the museum! Back on the mainland, bundled back into the coach we’re tired after a memorable day, but there is another very welcome surprise in store as we make a stop at the town’s outdoor pool to soak our aching bones in the soothing, geothermal waters of the hot tubs as snow flakes twirl down from the night sky! We don’t like the phrase ‘Bucket List’ but we did, it’s no surprise what would be top of ours – a visit to Iceland. It’s fair to say that prior to the turn of this century, Iceland wouldn’t have made many people’s lists of must-see places. Its growing profile owes as much to its status as a popular location for films and photography as it does to the eruption of the Eyjafjallajökull volcano which made headlines after causing huge disruption to European air travel in 2010. But what makes Iceland unmissable? Iceland boasts a remarkable variety of things to see and do, as you might expect given it’s a land of contrasts. It earned its nickname ‘Land of Fire and Ice’ as it is home both to some of Europe’s biggest glaciers and also the continent’s hottest volcanic springs. Summer brings midnight sun and winter guarantees snow. Whilst Iceland is famous for its jaw-dropping natural landscapes, the capital Reykjavík has cultural and historical high points that any major city would envy. For somewhere with so much unspoilt natural beauty (and only about 1% inhabited) Iceland is remarkably accessible – it only takes three hours to fly to Iceland from many major airports in Europe and less than six hours from the East Coast of the U.S. Flights are no longer as expensive, with more carriers and budget airlines opening up routes. Although Icelandic is notoriously difficult to master, Icelanders all speak English impeccably. Iceland has the smallest gender gap between men and women in terms of political empowerment, educational attainment, economic participation and health worldwide. It’s a great country to visit as a lone female traveller. You might think we’re guilty of more than a little bias when we say that Icelandic people are the friendliest in the world, but don’t take our word for it - foreign visitors to the country voted Iceland the most friendly in a recent report by the World Economic Forum. I am named after my Icelandic maternal grandmother, Svava, who was born in 1911. She grew up in Reykjavik before travelling to England in 1937 where she married my English grandfather and settled to raise her family in north London. My Amma (Icelandic for grandma) was a vivacious, energetic lady who enjoyed gymnastics, hiking and horse riding in her youth, but throughout her life and most of all, music and dancing - “It feeds your soul, daaaarling!”. My grandmother Svava in Iceland. She loved nature and the great outdoors. There are strict rules to naming a child in Iceland with a list of accepted first names a parent can choose from. Currently there are about 1,712 boys names and 1,853 girls names. Any other name has to be approved by the Icelandic Naming Committee! Svava is on the list, but you are more likely to come across the male equivalent Svavar. Svafa - Old Norse meaning ‘woman from Swabia’. The name of the Germanic people derives from the Old German swēba meaning ‘free, independent’. Hmmm, not quite the same ring, I don’t even know where Swabia is or was! No mention of love there. Undaunted, I continue my search, unwilling to shatter the myth quite yet - after all I have spent my entire lifetime believing this myth, I’ll unearth the true romantic meaning some day!! If it’s any conciliation to me, my sister’s name is Lára. Imagine my sister’s disappointment to hear from my Mum that, in Iceland, Lára means ‘great diving bird’. Perhaps Lára needs to do a Google search too!